It feels like it's been forever (more in my next post) but I finally have a new outfit for you! 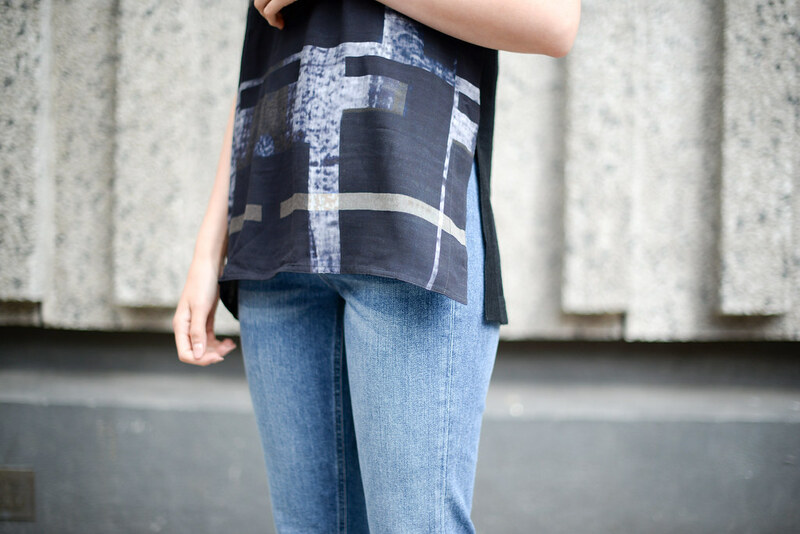 This ensemble is all from Jigsaw, and this top is part of their new collection (which is so pretty) that features this amazing cyanograph print that has been inspired by photography and the layering of imagery. I love that it's a simplistic shape, and still really minimalist but has a story behind the design. To quickly touch on the rest of the outfit, how cool are these shoes? They weren't in stock when I popped into their Duke Street boutique so I had to charge home and order them online and I'm so glad I did! Lastly, these jeans genuinely fit an absolute dream. I got a W24 for reference, and it's like they were made for me, which never happens as I've got the weirdest body shape. What's do you think? I'm really liking the whole "casual-but-I'm-actually-wearing-silk" vibe. love the print of the top! great backdrop to photo it in too! In love with these pumps, look so comfy and different to others out there!